Addis Ababa, 17 January 2018 – The Tenth African Union Gender Pre-Summit officially kicked off today, Wednesday 17 January 2018, at the African Union (AU) Headquarters in Addis Ababa, Ethiopia. The Gender Pre-Summit (GPS) is holding under the theme: “Winning the Fight against Corruption: A Sustainable Path to Gender Equality and Women’s Empowerment in Africa”. The meeting is chaired by Mrs. Mashair Ahmed Elamin Abdalla, Minister of Security and Social Development of Republic of Sudan and Rapporteur of the Specialised Tecchnical Committee (STC) Bureau on Gender and Women Empowerment. Representing the Chairperson of the AU Commission, H.E Moussa Faki Mohamed, at the opening ceremony, the Commissioner for Political Affairs of the AUC, Amb. Minata Samate Cessouma, underlined that, Gender Pre-Summit meetings have played an important role in influencing and shaping AU policies on gender equality and women's empowerment. Applauding the decade long journey of the GPS, Amb Cessouma added that: “ the transformation of the pre-summit on gender from a civil society platform into an institutionalized political platform of the AU is testimony to the importance of a strong partnership between the AU and civil society organisations. “I would like to express my deep gratitude to GIMAC and other Civil Society Organizations from the continent and the diaspora who helped the launching of this platform.» She noted. Amb. Cessouma further underscored that the 10th Pre-Summit is an opportunity to reflect on the progress made over the last decade and to plan the way ahead, particularly in the context of the new AU Reform and Agenda 2063. With regards to the successful implementation of Agenda 2063, the Commissioner emphasized that corruption is a greater obstacle and such forums are crucial to help the AU develop innovative intervention strategies to fight corruption. During the meeting, the theme of the AU-Gender Pre-Summit (GPS) that is aligned to the 2018 theme proved to be a well-conceived and timely issue as corruption and gender inequality are closely connected. The meeting unanimously and singularly pointed out that corruption disproportionately affects the poor especially women and perpetuates poverty by affecting public programs meant to benefit the poor. Honorable Dr. Jean A. N. KALILANI, M.P., Chairperson of the Bureau of the African Union Specialized Technical Committee (STC) on Gender and women empowerment and Minister of Gender, Children, Disability and Social Welfare of the Republic of Malawi in her opening remarks highlighted that it is the responsibilities of Ministers responsible for Gender and Women Affairs to be actively involved in advocating for the eradication of corruption. “It is our responsibility as Minister to ensure that the disparities persistent in the region in the area of gender equality and empowerment of women and youth especially young women are eradicated.” She noted. Mrs. Demitu Hambisa Bonsa, Minister for Women and Children Affairs of the Federal Democratic Republic of Ethiopia in her welcome remarks stated that corruption is one of the root causes of gender iniquality and therefore are closely related. She indicated that “where there is gender inequality, corruption flourishes and where there is corruption, gender inequality flares”. On the way forward she underscored the need to win the fight agaist coruption so as to ensures the sustainablity of gains in social, economic and poplitical development, in general and in gender equality and women empowerement in Africa in particular. More over,the fact that women as agents of change are often more effective than men at fighting corruption in their commitments was also highlighted in the meeting. According Mr. Philip Baker, Canadian Ambassador to Ethiopia and Djibouti and Permanent Representative to the AU, listing women’s engagement in the fight to end corruption include community mobilization and education on anti-corruption, spearheading public campaigns and conducted advocacy against corruption in partnership with legal, governmental, civil society and international bodies. Mr. Baker, who also represents Development Partners at the AU Headquarters added that “the importance of empowering women and girls in the fight against corruption cannot be understated”. The 2018 Gender Pre-Summit (GPS) is organized by the AUC Directorate of Women, Gender and Development (WGDD) of the AUC in collaboration with the Department of Political Affairs (DPA), African Union Advisory Board on Corruption (AUABC), in partnership with the Civil Society and the UN, supported by International Development Partners. Additionally, the year 2018 also marks the 10th anniversary of the AU-GPS, which has played a significant role in influencing and shaping African Union (AU) policies on gender equality and women’s empowerment (GEWE) and ensuring the inclusion of the critical voices of women and their perspectives in AU. 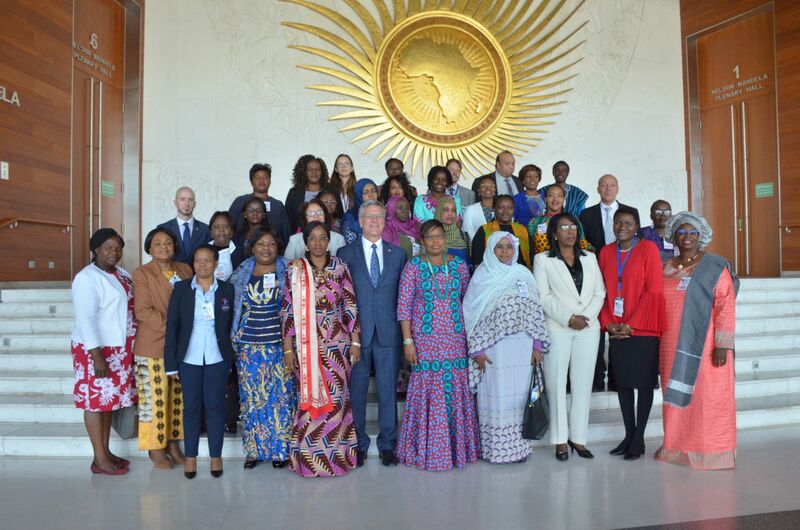 Participants for the 2018 Gender Pre-Summit drawn from African Union Member States; Ministers responsible for Women Affairs, representatives of the Specialized Technical Committee (STC) meeting on Gender, , AU women ambassadors; AU Organs, Representational and Liaison offices; Regional Economic Communities (RECs) and RMs; Civil Society Organizations & Diaspora organizations; UN Partners; International Development Partners, Media and invited guests.